Look for Gregg Smith's beer history books at BeerBooks.com. The story of Louis Menapace was not unique. Taverns, saloons, and beer gardens were often the first friendly moments of socializing a new arrival spent in America. It was an American way of doing things, and why not, the story of taverns paralleled that of the country, all along the way providing an everyman's view of the nation's development. It painted a portrait of American growth as seen through a beer glass. As the first settlements appeared in the 1600's, taverns were as important a part of any village's plan as a fire, street, sanitation or police department is today. No village of the 1600's dreamt of life without a tavern. It was from that early position of perceived necessity that the local bar assured it's survival. With the start of any town's construction, the location of the tavern was given consideration equal to any other aspect of the community. A good tavern was vital to the health and life of the town and as such it was worthy of a central location. More often than not it was placed next to the local meeting hall. This was the case in 1651 when Boston granted permission for a new tavern, provided the owner "...keepe it neare the new meeting house." At times the association was more than adjacent. In 1633 the former Massachusetts home of Governor Winthrop was transformed into a meeting house that later became a tavern named the 'Three Cranes.' From those innocent beginnings the church and tavern in America embarked upon an uncomfortable relationship. Functioning as an area's social center was certainly an important role, but the inns and taverns also contributed to the local economy. Inns were more than a bar, to traveling merchants they were a combination of the market, trade center, entertainment complex and hotel, everything a businessman needed to ply his trade. Another benefit was provided as visitors staying overnight brought news and information from throughout the colony. As a crude, but effective means of communication, it helped the settlement maintain contact with the mother country, and further assured a tavern's position in the community. Influence of the local tavern reached far beyond the immediate village, it was the focal point of an entire region, and soon the authorities recognized its value. There was only a small budget for public works, and government buildings were virtually non-existent. Yet, it was essential for officials to conduct and maintain the observance of English law. The practical solution to bring government to outlying areas by a system known as "riding the circuit." By using a tavern room they were able to hold court without encumbering the crown with great expense. It was so successful they soon assigned the tavern yet another duty, one that helped assure the security of the region. Threats to a frontier town came from a variety of places and protection was the key to survival. However, with problems of its own back on the continent, the powers in London were reluctant to station a standing army in the America's. Thus it was up to the colonists to provide their own defense by a 'volunteer' militia. Thrifty governors, knowing it was difficult for colonists to attend the mandatory training found a simple solution; designate a tavern as the meeting place, and supply a free keg of beer. The plan worked. Later, when the colonists faced off against their former government at Lexington, Massachusetts, the minutemen gathered in exactly the fashion they were trained, and their leader, Captain Parker, established his headquarters in the nearby Buckman Tavern. Conducting a business so critical to the well being of a town brought wealth to the tavern's owners, wealth that was reflected in the structure itself. Dr. Wayland F. Dunway documented what he considered an adequate tavern of the day... "The better taverns were usually built of stone, and their accomodations and tables were a constant source of pride to the owners. Whatever the class of tavern, however, its one indisputable feature was the bar, which provided liquid refreshments not only for jaded travelers but also the inhabitants of the countryside." More affluent versions would have a parlour, separated from the 'taproom' as an exclusive section reserved for the most wealthy and influential patrons. As a combination hotel and restaurant, taverns drew currency into a region. For more than two centuries, from colony to independent country, the tavern served communities as the focal point of most civic functions, but then near the middle of the 19th century various factors gradually shifted the tavern's place in society. Times were changing, the country was growing, ready to take its place as a world power, and as it did the tavern served a new set of needs. American expansion opened a continent of wealth, and as the young government, and the nation's economy, became more prosperous it was able to construct public buildings specifically designated for courts. With that improvement the legal system no longer conducted sessions in tavern rooms. Barristers continued to frequent tap rooms, but it was after hours, and down the street, from the new courthouse. Economic forces also modified the tavern's place as the center of commerce. At first the colonies fortunes hinged upon an economy of farm based goods, but as industries emerged, inns no longer held a position at the center of commerce, which shifted to cities and specially designed trading centers. Despite the changes in the legal, business, and military status of the tavern it continued as a small town's center of communication, and for social gatherings in sparsely settled regions. As the early 1800's passed into mid century the introduction of lager beer, a light beer well suited to American tastes, boosted beer sales and assured the enduring success of the local watering hole. Along with America's rise, and political changes in Europe, a new role was defined for the tavern. It became a welcome mat to newcomers, a place were immigrants took the first step towards becoming Americans. Mid-nineteenth century Europe was a society in turmoil. Centuries of war, excessive taxation, political oppression and a polarized society brewed an unstable atmosphere. Tales of America's wide open spaces, love of personal liberty and an opportunity to succeed shone across the Atlantic like a beacon, drawing emigrants to the new land. Though it hadn't been that long since fellow Europeans had settled the continent, their customs and traditions had already drifted away from that of the motherland. Americans were a strange breed; things were done differently. Beginning life anew was often unsettling, and in their struggle to adapt, many newcomers gathered together in groups based upon their country of origin. At times there were formal clubs and associations, but more typically the institution for the common man was a tavern or saloon. As the population grew the saloon was a place for people of similar interests and background to assemble, share experiences, and a pint, in an early form of networking. In this capacity the tavern helped America assimilate the European immigration. While taverns offered throngs of European-Americans the comfort of familiarity, they also at times drew the unwanted attention of bigotry. Germans in particular were an easy target, they had difficulty with the English language, and they tended to stick together in small, tight-knit neighborhoods. Their consumption of the popular lager beer was exaggerated and a subject of ridicule. One lithograph of the time showed a drunken German telling a policeman "I trinks lager, and I have only trunk tirty glasses, so you shust go avay." It was a normal attitude of that period and an unfortunate condemnation of a class that was among country's the most loyal citizens. The most infamous example of bias was centered around a political organization called the 'Know-Nothings', an ultra-conservative, Americans only group, that gathered sufficient members to elect their candidate, Dr. Levi Boone, as mayor of Chicago. Mayor Boone's personal bias was against the Germans, who had formed their own neighborhoods, churches, trade unions and even theaters. Moreover, he looked upon their ubiquitous beer drinking as a uniquely German evil. Along with Chicago's Irish, he saw Germans as a sinisterly foreign threat to Chicago and America. Viewing it as a personal challenge he set out to eliminate this alien menace and harm both groups as much as possible. The weapon he chose was beer. On the first Sunday that Boone enacted the law over two hundred German beer drinkers were arrested and a trial date was set for April 21, 1855. As the court was about to open a crowd of 300 barkeepers moved on the courthouse. As they approached Clark and Randolph streets the column was headed off by police and forced back toward the North Side. At three o'clock the protestors returned and when about half the mob had crossed the river, police raise the draw bridge, dividing the force in two. This only further ignited the crowd; firing broke out, and both sides suffered wounded. As night fell things quieted but the beer lovers had made their point and Boone eased his campaign of hatred. The long range effect of the "Chicago Lager Beer Riots" was to discredit the Know-Nothing party which faded from the Windy city's political scene. Taverns and saloons gained a significant victory and remained a meeting place for immigrants. 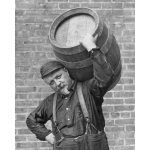 Popularity of saloons and lager beer grew steadily, and by 1860 US commercial brewers rejoiced over the first time the country achieved a national production record of one million barrels. Lager beer was responsible, and for the next century and a half gained total dominance over other beer sales. As described by Michael and Ariane Batterberry in their Book, "On the Town in Old New York"
"Lager beer was the German immigrants' gift to America, and its mass production irrevocably changed the nation's drinking habits. Lager was light, delicious, and, happily, it could be consumed in quantity." Changes in drinking habits along with the broader appeal of lager occurred at precisely the right time. The technological advances in brewing science along with establishment of an industrial economy threw open the door for brewers willing to risk expansion. Americans were ready for a cold beer and the German immigrants were prepared to indulge them. Breweries expanded capacity as quickly as possible and then marketed this inventory through a network of "Tied Houses". What the brewers had done was to either build, operate, or indebt local bars which were "tied" to the brewery. Sometimes it was through a 'no-money down' sale of beer. At other times, big brewers bought loyalty by supplying a 'free' back bar in exchange for carrying the brewery's beer. Essentially they were cashing in on the popularity wave, and dispensing product directly to the public without a middle man. After all, the six pack to go hadn't been invented, and beer sales were primarily through bars and saloons. As the immigrant population grew more dense in cities, the tavern evolved into a type of super saloon - the beer hall. Most famous of the beer halls was New York's Atlantic Garden, located in the Bowery. Reportedly capable of seating more than a thousand at a time, beer drinkers kept the seats full, in fact a beer garden was one of the few places that a respectable woman, accompanied by her husband of course, could go out for a beer. With a reputation for acceptable merrymaking, the beer gardens were none-the-less, often scenes of over-consumption. A writer for the New York Times described a typical evening "The object is to drink just as much beer as you can hold... The bill of fare was varied and extensive. Following is a translation: Beer, Cigars, Beer, More Beer, Cigars, Beer, Beer, Beer, Beer, Beer, Beer, Beer, Beer, Beer, Beer, Beer, Beer, Beer, Beer, Beer." Managers of the large beer halls were aggressive marketers, and saw the various immigrant associations and clubs as a ready-made market. Beer Gardens launched an all out marketing blitz on this new audience. In what appeared to be a friendly gesture, the halls would offer associations free catering in exchange for scheduling an event, they did so with the confidence that they'd make back every cent and more on beer sales. Competition for hosting these events grew so fierce that the Atlantic Garden was soon offering association organizers catered food along with a five hundred dollar rebate for the privilege of hosting a party. Another group courted by the beer gardens was the infant labor movement. Workers who held their meetings in the hall were provided private rooms at no cost if beer was purchased. Bar tabs were picked up by the union treasury as a means of encouraging member attendance and all parties were happy with the outcome. Eventually union leaders attempted to alter the arrangement, recognizing that renting a private hall was more economical when the bar tab was eliminated, but the members dismissed such a notion. They were comfortable attending meetings at the beer hall, they could tip a few with the fella's and not have to explain a bar bill to the spouse, what could be better? Beer halls were a sure money maker and as new establishments opened they attempted to maximize profits by drawing crowds to larger and more magnificent temples of beer drinking. Largest of them all was built by Pabst in Harlem, New York. The grand opening awed patrons with a seating capacity of more than 1,400, it was simply the largest restaurant in existence. Years later, "The Milwaukee Sentinel" would print a review which praised the hall, describing it as... "eminently successful...Costly and splendid in architecture and illumination, possessing an orchestra that is only excelled in the best theaters its 1,400 seats are crowded from year's end to years end...It's exterior is on a par with other public buildings...It's interior is resplendent with frescoes, paintings, marble columns, colored lights, and exquisite table appointments..."
Less ornate saloons did an equally brisk business, and many of the strategies were the same. Especially effective was the "free" lunch. Indeed it was free, a seemingly endless bounty of food. In reality nothing on the no-cost buffet was left to chance, every item was selected for its effect of encouraging thirst and the subsequent sale of beer. A typical free lunch started with Rye bread, followed by an over-seasoned bologna, blood sausage in a German bar, or summer sausage in others. Most also provided a heavily salted, dried herring. Baked beans were another regular fixture, along with thin slices of yellow cheese sitting next to a bowl of hot and spicy, brown mustard. Garnishes included green onions and radishes when available, set out next to the ever present dill pickles. No tavern owner was totally altruistic and generous, they knew they'd make back three fold in beer sales what it cost to provide 'free' lunches and other giveaways. Well into the 1900's the formula for prosperity in the tavern trade remained the same. All that changed with prohibition. After repeal new laws prevented breweries from either owning taverns, or providing aid to retail accounts. With that many attractions of the old time saloon faded into memory. However, during the golden years of the late 1800's and early 1900's the saloon played an important, if self-serving role, in integrating the vast numbers of Europeans into American society. For countless thousands it was their introduction, and first taste, of a new land. At the end of his first evening in America Louis Menapace was thankful that he stopped in at the beer garden. During his short visit to the beer hall he met others in a similar circumstance, and their equal position brought them a certain sense of solace. Paying his tab, he thought how worth while the outlay from his small savings had been; tomorrow he would see one of his new friends about a job, and afterward maybe he'd stop back in for a beer. Gregg Smith is a GABF beer judge and author of four books including the "Beer Drinker's Bible" and "Beer in America: the Early Years" (both available at BeerBooks.com).He is a winner of 16 "Quill and Tankard" awards. The North American Guild of Beer Writers named him "Beer Writer of the Year" in 1997 and was a runner-up in 1996, 1997, and 1999. He is also the grandson of an immigrant who liked "an occasional ale."